South Hams' superb resorts, Bigbury Bay on the South Devon Coast is in the heart of an area of outstanding natural beauty. The area offers the ideal family holiday, wonderful safe sandy beaches with the historic Burgh Island and its unique sea tractor for crossing to and from the mainland when the tide is in. One of South Devon's best locations for spectacular coastal walks, windsurfing, canoeing, and golfing. There is a gallery of pictures of the local area here. 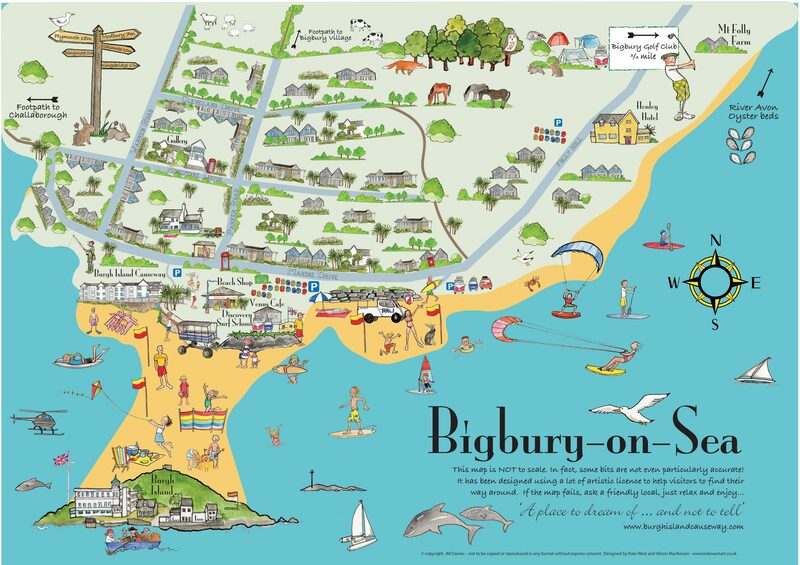 This Bigbury-on-Sea Map is your ideal guide giving you a full picture of the village showing the local area and parking. Click on the map for a full screen pop-up version. Copyright ©2014-2019. All Rights Reserved, no material on this site may be copied in any form without specific written approval.